It's interview time once again! Today's Q&A is with Samantha Grim, Summer 2013 intern and student at Cornish College of the Arts. Sam has a great aptitude for sketching & drawing things out on paper. It was my absolute pleasure to show her a few tricks of the trade and see the personality of her drawings come through when brought into a digital format. She knocked it out of the park with the above illustration for a client wedding invite. To see all of the projects Samantha collaborated on while working with us, check out her internship blog. Q: What is your favorite thing about being a graphic designer? I love incorporating art into everyday life, which is how I view a lot of design. I think that design is an opportunity to encourage creativity in the public, and I really enjoy seeing non designers respond to good design. Q: What was interning for Constellation like? My experience at Constellation was really inspiring. I had the opportunity to work with Sara, who owns her own business and gets to do what she loves all day. She really encouraged my illustration work and has helped inspire me to continue to work with more traditional media. I am now confident in exploring handwork in my designs, and had some great inspiration for my upcoming BFA show. 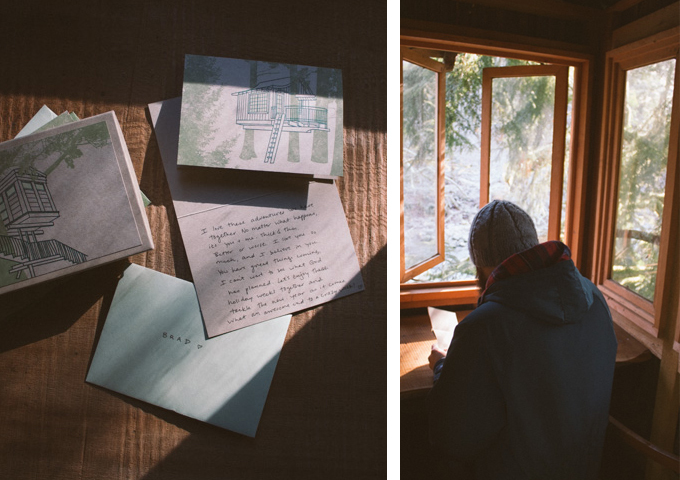 Q: How did working with letterpress change how you work now? Letterpress taught me to get off my computer, and that working with my hands can really offer some great inspiration. It also taught me creative problem solving skills, sometimes you get some really unique problems in the printing process! I also have really come to love letterpress work, and am eager to use presses whenever possible! Q: What are your plans after school? Ideally I would like to work in an environment where I can utilize my illustration and traditional media interests. If that opportunity doesn't present itself in time, I have really considered starting my own small freelance business or studio. Q: What is your favorite place to eat in Seattle? Downtown I love Delicatus. It's a sandwich place that I actually discovered through Sara! It's in pioneer square and has a great interior as well as delicious lunch/dinner items. I also frequent Hi-Life in Ballard. It's a refurbished fire house that has really good seasonal food, and a super fun atmosphere! Q: What is your favorite place to shop in Seattle? I love the Fremont area! It has a great Sunday market, if you've got time I recommend that. Within walking distance are some really extensive thrift shops, as well as some really unique bike shops. It's an easy area to just wander around and discover some great shops. 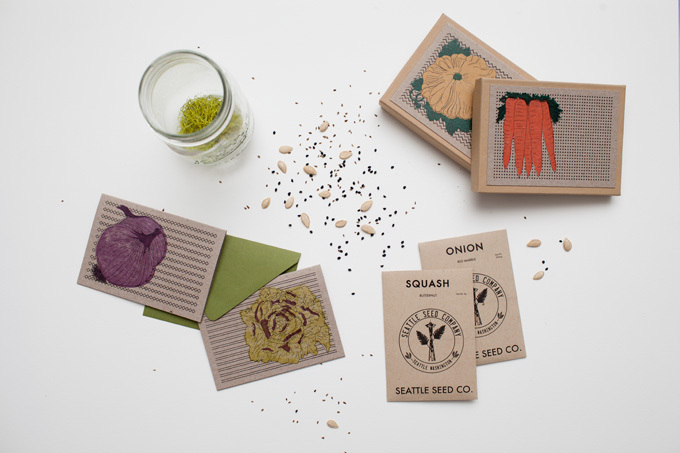 We are proud to introduce Organically Yours, a series of letterpress greeting cards with corresponding seed packets, produced in collaboration with Seattle Seed Company! Sander, the owner of Seattle Seed Co., contacted us awhile back about some printing work, and it didn't take us long to realize our companies were made to collaborate! Seattle Seed Company is dedicated to offering organic, heirloom and non-GMO seeds in an effort to promote the general health and sustainability of our communities. 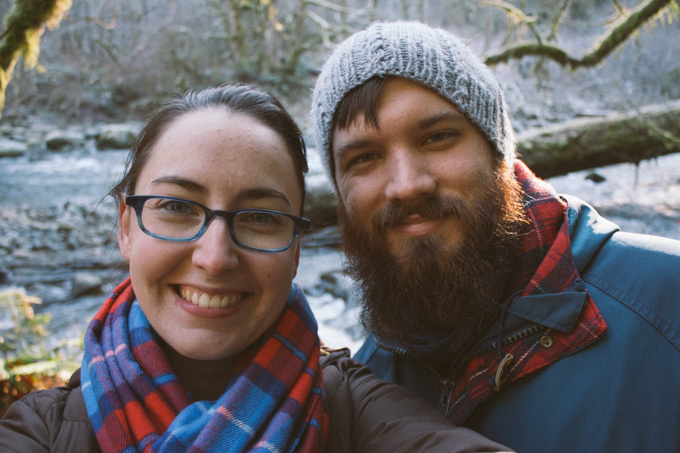 As a strong proponent of supporting local communities and preserving the environment, Seattle Seed Company also encourages folks to buy locally and grow their own food when possible. They're a family-owned and operated business that was started with the idea that buying non-gmo, organic seeds should be fun and easy. All of their varieties will grow in the Northwest (and in warmer climates, of course) and all of their packaging and shipping materials are either plantable, compostable, or 100% recyclable. Each Organically Yours card is letterpress printed by hand on 100% recycled paper with a foot-powered antique printing press. 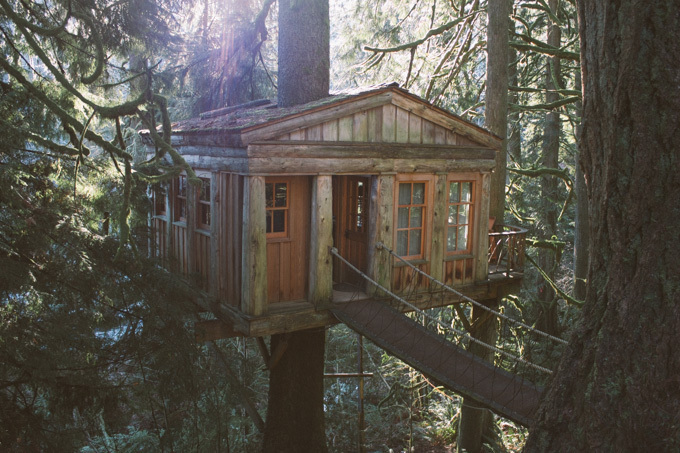 (No electricity used except for the lights! And the music. You gotta have music.) Each card stars it's own veggie and comes with a corresponding packet of heirloom seeds. All the card backs include a recipe featuring the vegetable shown on the card front. The boxed card sets come with all 5 veggie cards & seed packets, plenty to send to all your favorite veggie lovers. We absolutely love the idea of sending someone the gift of plant life with your message! They're perfect for long summer days, wish you were here's, and small gifts of thank you. We even think they'd be sweet cards for newlyweds - give them some new life to plant in their new home together! Something magical happened on Twitter today. A nerdy joke that my husband has been snickering about for awhile was released into the wild, and it grew wings. 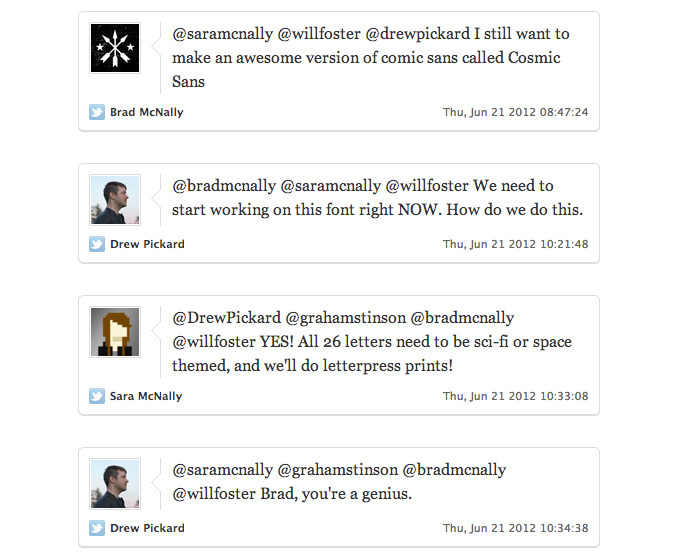 So here's the idea: Cosmic Sans, a series of 26 sci-fi and/or space themed letterforms, designed by 26 designers. Each letterform must be inspired by "the cosmic" and a riff on Comic Sans. ("Riff" here meaning it must be sans serif, and in some way traceable back to Comic Sans, but NOT ugly. Points for good design.) Each designer will produce a letterform, and a 12" x 12" art piece featuring the letterform. All 26 pieces will be printed (handmade printing methods encouraged, but not required), hung in a Seattle gallery show, and showcased in an online gallery for posterity. Are you cosmic enough to join? (Please do!) Comments on this blog post will be the official registration for the series. Include your name, portfolio site (so we can get to know you), and which letter you'd like to do. Open to all, but we will jury the final 26 pieces for the show (if we get a crazy turnout). Are you excited? We are! Due date and additional info on the gallery show when we have all 26 letters accounted for!